The Governor had the right to recommend candidates for the Board of Regents. The Legislature had the right to appoint the Regents. 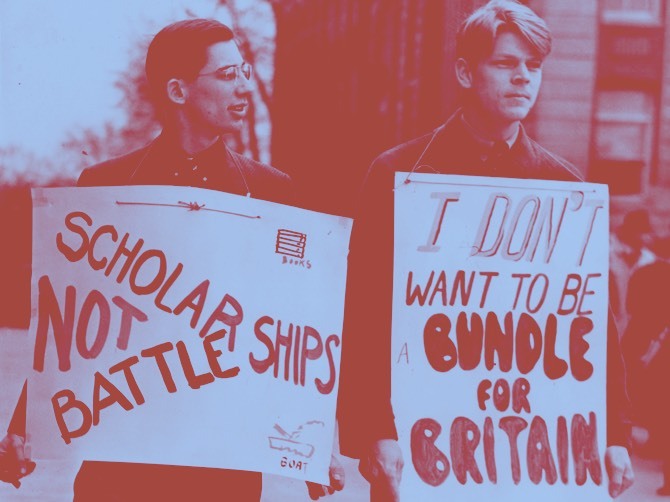 Conservatives in the University administration and in the Legislature insisted that the Governor’s nominees for regents were “political” choices, or “tools of the Farmer-Labor party,” while their candidates, often Republicans and conservatives, simply cared about the University. Therefore, the choice of regents throughout the era of Farmer-Labor leadership was highly contested. The State Legislature that was empowered to select four new regents for six year appointments was divided in 1937. The State House of Representatives was primarily liberal. The State Senate was primarily conservative. Was compromise possible? The battle within the Legislature and between Governor Benson and the Legislature was front-page news in the Minneapolis press from January to August of 1937. 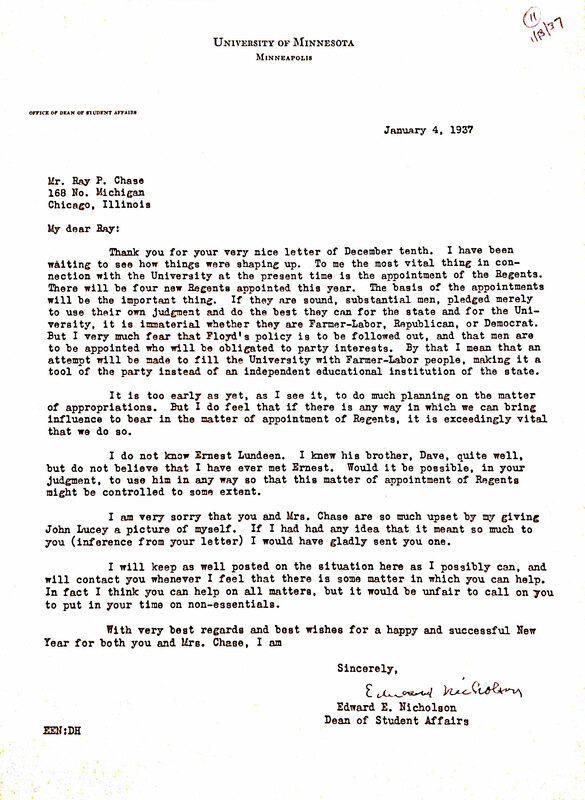 Dean of Student Affairs Edward Nicholson contacted Ray Chase in January of 1937 to propose a shared agenda for secretly affecting the University for that year, as they had for previous years. He placed the selection of the Regents at the top of his list. Nicholson argued that they had to defeat the Farmer-Labor nominees. Student rights and academic freedom were not part of their shared vision for “Keeping America American.” Nicholson brazenly suggested that Chase might be helpful in connecting legislative funding for the University to the choice of regents who were not sympathetic to the Farmer-Labor vision. Dean Edward Nicholson’s letter marks the beginning of the campaign to influence the Legislature’s choice of regents under Governor Benson. Dean Edward Nicholson set priorities for his work with Ray Chase, Republican operative. His plan was to campaign to stop any appointment of a member of the Farmer-Labor Party to the Board of Regents as four vacancies became available. He encouraged Chase to use his influence in the Legislature, including holding up appropriations to the University of Minnesota. The two houses of the Minnesota Legislature could not agree on four new regents, despite the efforts of a joint committee to find a compromise. 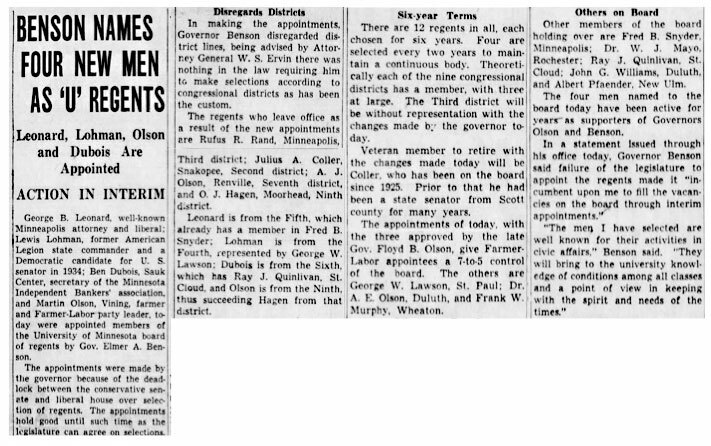 This impasse had happened to Governor Olson in 1935 as well. In this circumstance, Governor Benson had the Constitutional right to select the regents, but only for a two, rather than a six-year term. The Minneapolis Star not only featured the new appointees, but noted the political makeup of the new Board of Regents—seven appointed by Farmer-Labor governors and five who were not. The Minneapolis Star reported on Governor Benson’s choice of regents that resulted from a deadlock in the Minnesota legislature. 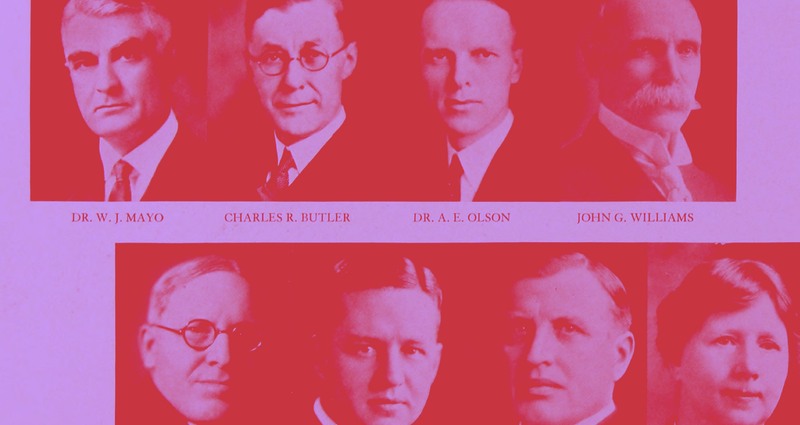 In 1937, a deadlock between liberals and conservatives in the Minnesota legislature stopped Governor Benson from filling four vacancies on the University of Minnesota’s Board of Regents. The inability of the legislature to agree on their own appointments was a partial political boon for Benson, who selected long-term supporters and tipped the board in the favor of his Farmer Labor Party. Because of the inability of the legislature to select regents, Benson could only appoint his choices for two-year, rather than the full six-year terms. George B. Leonard (1872–1956), a well-known lawyer, was one of the four regents selected by Governor Benson. Regent Leonard was a close friend of Governor Floyd Olson until his death. Leonard was a founder of the Farmer-Labor Party and a lifelong defender of clean government, workers’ rights, and civil liberties. With the Urban League, he worked to integrate the University’s School of Nursing in 1933. The only public office he accepted in his long career was to serve as a member of the Board of Regents. George Leonard was the first Jew to serve as a Regent. Born in Kovno, Lithuania, he immigrated to the United States and studied law at the University of Minnesota. He founded the law firm Leonard, Street and Deinard in Minneapolis in 1922. Their firm was the first downtown law practice to hire Jewish and non-Jewish lawyers, and the first to invite a woman to serve as a partner. 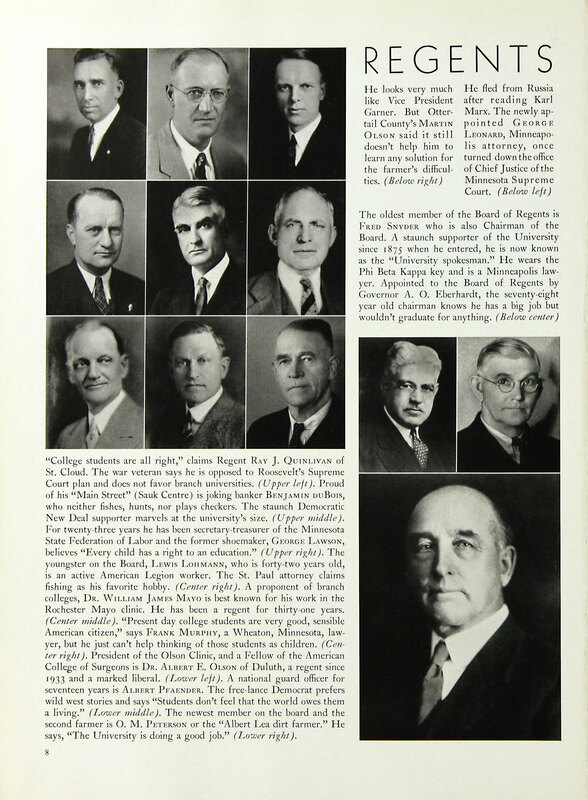 The Gopher yearbook introduced the Regents to students with brief stories about each of them. Leonard’s highlighted his politics and his refusal to take positions in government. George Leonard (1872–1956) was a member of the Board of Regents appointed by Governor Elmer Benson. He was a founder of the Farmer-Labor party and political activist. He founded the law firm Leonard, Street and Deinard, which was the first to include Jews and women partners. George Leonard served on the board of the National Association for the Advancement of Colored People in Minnesota, and in that role, worked to integrate the University of Minnesota’s School of Nursing. As a regent, he worked to restore the compensation of Professor William Shaper, who was fired by the Regents in 1917 and then reinstated in 1938. The Regents’ reversal led to the creation of academic freedom for faculty at the University of Minnesota. Regent Leonard played a crucial role in realizing Governors Olson’s and Benson’s commitment to academic freedom. 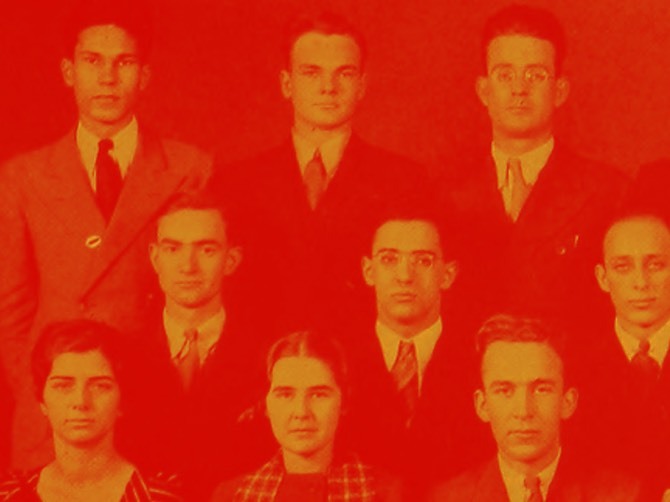 In 1938, the Board of Regents took up the case of Professor William Schaper, a professor of political science, who was fired from the University five months after the United States entered WWI in 1917. 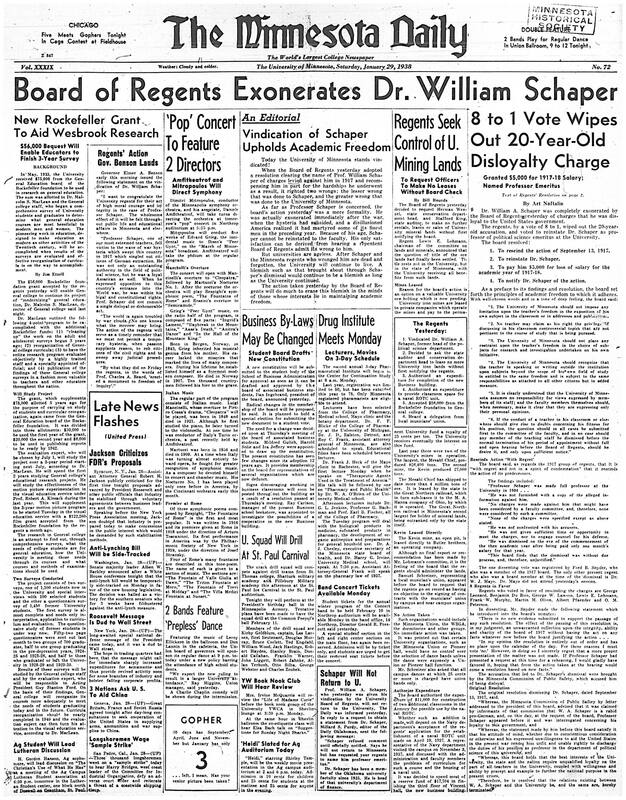 The Board of Regents revisited the case of William Schaper, now at the University of Oklahoma, because he had the strong support of Governor Benson and the Regents. Schaper was active in the Farmer-Labor party and politics when he lived in Minnesota. When the Regents exonerated him they realized a commitment both to justice and to academic freedom. Regent Leonard shaped the offer to Schaper that included his reinstatement as a full professor, and $5,000 in reparations for the loss of his salary. Schaper accepted the settlement but remained at the University of Oklahoma. The Board of Regents also accepted a resolution, now in the President Guy Stanton Ford era, that assured faculty academic freedom and due process. The Minnesota Daily reported in great detail about the resolution of the case, including the resolution on academic freedom. More than twenty years after he was dismissed from the University of Minnesota for being “pro-German” and disloyal to the United States at a time of war, the Board of Regents voted to exonerate Professor Emeritus William Schaper on the principle of upholding academic freedom on campus. Eight members voted in favor of his reinstatement to the university, while the two members who had sat on the original committee in 1917, Fred B. Snyder and W.J. Mayo, voted against or abstained. Art Naftalin, the student journalist who wrote the story, went on to become the DFL Mayor of Minneapolis, and was a strong supporter of the Farmer-Labor Party. He wrote his PhD dissertation in the Political Science Department about the Farmer-Labor Party.